This month’s top five tips are for those of you who like to plot your novels, or for anyone who maybe wants to try writing a novel but is a bit afraid and has no idea where to start! Writing an 80,000 word novel can seem impossible when you’re sat staring at a blank page with nothing but a vague idea. Some people write by the seat of their pants (they’re called pansters) and that works for them, but I’m not like that and if I don’t know where I’m going, or what needs to happen, I get stressed and wound up. It stops me being able to write because my creative side doesn’t feel safe enough to come out. 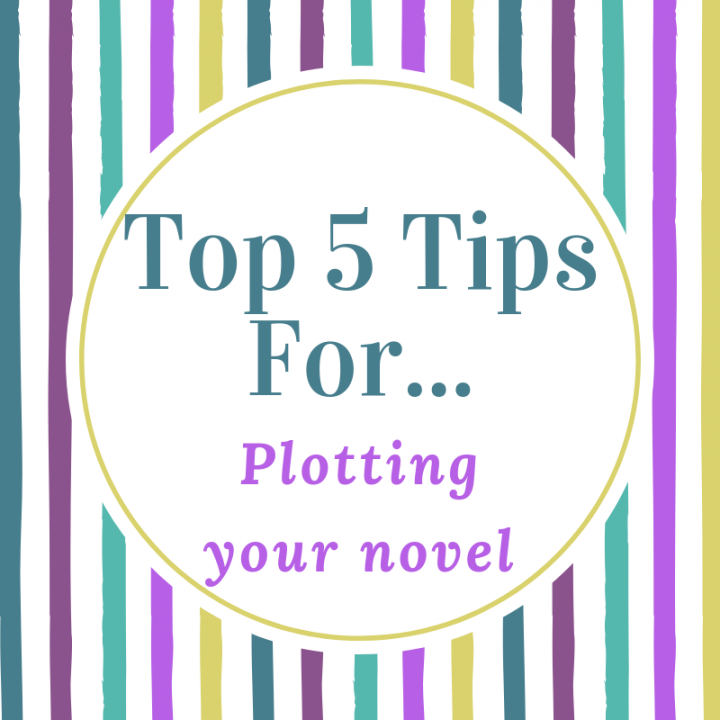 So, if you’re like me, then here are my top five tips for plotting your novel. What do you want to happen during the course of your novel? For example, in a romance story it might be that you want your female main character to fall in love with your male main character, but you want things to go wrong along the way. Boom! You’re now beginning to turn your overall vague idea into an actual plot. The next thing is to think about how that’s going to happen. How are your characters going to get to the point of falling in love? What events can you think of that will bring them into contact? See, now you’re starting to think of scenes or chapters in your novel. You’re getting even closer to having it all outlined. You don’t need to have detailed information at the moment, just one word sentences will do fine. Each character needs to have an emotional arc for the story, during which they’ll change. How do you want your characters to change? Perhaps your FMC (female main character) is very selfish and through the course of the novel she’s going to become less selfish. Are there any events from step one where this could happen? Do you have ideas for new events or scenes where she might begin to change? It could be that your MMC (male main character) is going to begin the story very career focused and slowly bring balance to his life. Again, think about how these changes might occur and you can build events, scenes, and plot twists that can make this happen. Now we’re digging a little deeper into your plot and you’re beginning to build together a sequence of events. The plot is taking shape! These are really important because these scenes or events are the catalysts for your main characters to change and begin their journeys. The inciting incident should come pretty early on, if not in the first chapter. A good example of an inciting incident is in Harry Potter and the Philosophers Stone when Harry gets his letter from Hogwarts and his horrid uncle hides it. It’s a game changer for Harry and his life changes dramatically after this point. So once you’ve figured out the inciting incidents for your main characters, you’ve got the start of your novel sorted! No one wants to read a story where everything goes well and the main characters achieve everything they want really easily. Not only does life not happen that way but it’s boring! What we want as readers is to see people suffer and overcome strife. So what hardships can you place in front of your main characters and even your minor characters? Again, this should lead you to think of scenes or events that you can note as plot points. Make sure you tie them into the overall emotional arc of your characters so they’re happening at the right times to facilitate changes in your characters outlook and move them towards where you want them at the end. Now we’re building in even more plot points. By now you should have a decent sized list of different events or ideas for scenes for all your characters though you may not be clear what you want to happen when. Now you’ve got a list and an emotional arc for your characters you should have an idea of what events come first and what come last. You need to set all the different ideas into a chronological order against the overall emotional arc of the characters. This will guide you to what should happen when. For example, you can’t have an event where they admit their feelings for each other until nearer the end when they’ve got to know each other. And you can’t have them arguing at the end when they should be beginning to get along. By looking at each event against the emotional arc you’ll have more of an idea of where it needs to come in the chronological order. At this stage, you might also add a specific timeline so you know exactly when things are happening and how much time lapses between each incident. I find this really useful so when it comes to writing I can throw in what day it is or how many days it was since an event happened. This helps ground the reader in the sequence of events and is definitely worth getting right at the planning stage. Trust me, it can save some major plot holes! By the time you’ve been through these steps you should have a pretty decent outline for your novel. If you’ve got more ideas to add, get them down now, or you might want to start writing and see where your plan takes you. There’s no right or wrong way to write, you have to do what feels natural to you. And the more you write the more you’ll refine your own process. Oh, and don’t forget, your plot might change as you get to know your characters through the writing process! I’d definitely have a notebook to hand for when these things happen, but try to embrace it. It really is half the fun of writing! Have you got any good plotting tips to share? Let me know in the comments below!